Qty 1 – 16-oz Container of GOO CHILL ™ for Canine Allergy Anxiety. 100% Natural GOO-Licious Peanut Butter Treat. 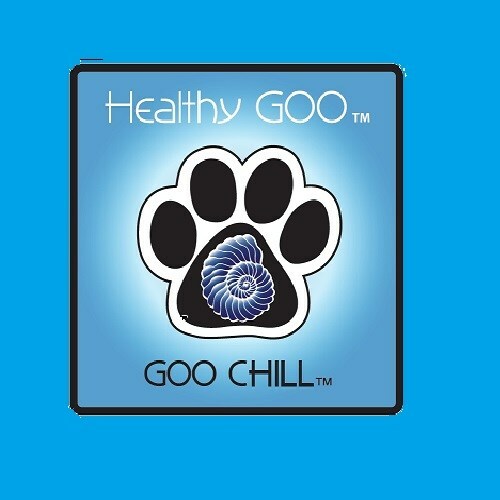 Use GOO CHILL “Solo” or in Combination with Allergy Fighting Doggy GOO. A 16-oz Container of GOO CHILL = 90 TeaSpoons. This may translate to 90 Days to 30 Days Supply depending on your DOG’s Weight and whether your Animal is “Well” or “Allergy Stressed”. Please review Feeding Instructions Site Page for further Detail. Allergy is a Nasty, Tenacious, Entrenched, Cumulative, Progressive, 24/7 Chronic Disease. A “Mis-Wiring” in the Immune System. 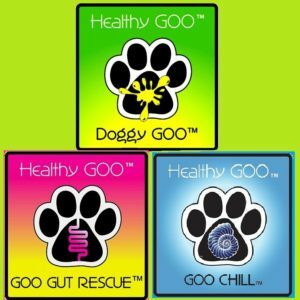 Healthy GOO’s / Doggy GOO Glow / Goal / Strategy is to Naturally / Slowly Leverage the Natural Adaptive Power of the Immune System to ReTrain / ReCaliberate / Build heightened “Internal” Immune Tolerance to 15 Major Enviro Allergy Sources, such that via this heightened Internal Immune Tolerance, “External” Allergy Symptoms are Not Triggered / Mitigated. As such, this GOO Strategy can not be Rushed & Takes Time. PET Parents are asked to Review Details of the STRESSed Phase ( Approx. 90 Days ) & WELL ( Ongoing Thereafter ) Phase of Doggy GOO’s Protocol to allow correct GOO Planning / Expectations. No One Knows the Health Status of your Animal better than You & your DVM. Further, because many Co-Factors come into play regarding the Severity / Entrenchment of Your Animal’s Allergy Status, GOO is always interested to Learn Your Animal’s Past / Present Allergy Symptoms, past Itch Suppress Measures taken, Age / Breed. GOO Welcome’s Your Insights in the Comment Section of your GOO Order. Because GOO uses the Best / 100% Natural / Human Grade Peanut Butter. Please be Sure that Your Dog “Luvs” Peanut Butter. No Return / Guarantee Policy Statement: Because of the Ingredient Profile and unique Health Focus of Health GOO’s Product’s, Healthy GOO cannot offer any Guarantee / Return or Refund. Pet Parents are asked to Call Healthy GOO / 855-246-2426 with Any GOO Questions before Purchase. No one knows the Health Profile / Status of your Dog better than You and Your DVM. As such, it is Suggested that before taking any Healthy GOO Product Action, that you first Consult your DVM.